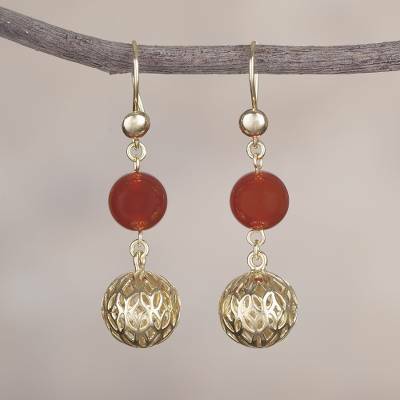 18k Gold Plated Agate Dangle Earrings from Peru, "Celebratory Globes"
Perfect for a party or celebration, these Peruvian dangle earrings feature two orbs of red-orange agate. Peru's Marianela Vargas designs the earrings, crafting them with 18k gold plated sterling silver, elaborated with intricate openwork motifs. You can find gold plated agate dangle earrings 'Celebratory Globes' by Marianela Vargas in jewelry categories such as Birthstone Earrings, Agate Earrings, Gold Earrings, Gold Plated Earrings, Silver Earrings, Sterling Silver Earrings and Dangle Earrings. Enjoy exploring these sections for other Novica treasures.